^ 2.0 2.1 2.2 Population by States and Ethnic Group. Department of Information, Ministry of Communications and Multimedia, Malaysia. 2015 [2015-02-12]. （原始内容存档于2016-02-12）. ^ 6.0 6.1 6.2 Abdullah, Hasfiza. DARI PRANG BESAR KE PUTRAJAYA. Dewan Bahasa dan Pustaka. 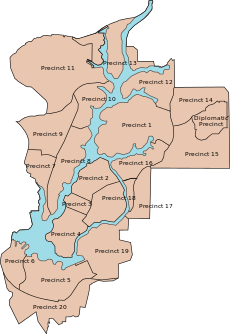 February 2012 [2015-10-26]. ^ 城市绿肺．布城留倩影. 星洲网. 2015-02-01 [2017-07-16] （中文（简体）‎）. ^ "Closer ties between Putrajaya and Sejong, Korea". (Archived from the original) The Star (Malaysia) (马来西亚). Saturday 6 April 2013. Updated on Friday 26 April 2013. Retrieved on 1 January 2014. ^ "Malaysian envoy acclaims Sejong City." (Archive) 韓國時報. 23 September 2012. ^ 2010 Population and Housing Census of Malaysia (PDF). Department of Statistics, Malaysia. [2012-06-17]. （原始内容 (PDF)存档于2014-05-22） （马来语及英语）. 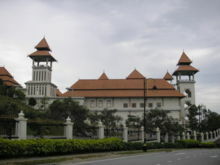 ^ Putrajaya Botanical Garden (Taman Botani). Tourism Malaysia. [2014-05-25]. （原始内容存档于2014-05-25）. ^ The main attractions in Putrajaya. ^ Bhd, Express Rail Link Sdn. KLIAtransit Schedule - KLIA Ekspres. www.kliaekspres.com. [2017-03-26] （英语）. ^ MYMRT | MRT Corp - Official webpage for the Klang Valley My Rapid Transit.. www.mymrt.com.my. [2017-03-26]. （原始内容存档于2017-06-27） （英语）. ^ 衔接赛城 布城拟设有轨电车. 南洋商报. 2016-02-22 [2017-07-16] （中文（简体）‎）. ^ PENGANGKUTAN AWAM PUTRAJAYA SDN BHD. www.papsb.com.my. [2017-03-26] （英语）. ^ Ahli Parlimen. 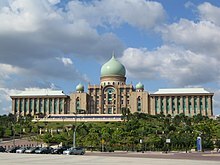 Portal Rasmi Parlimen Malaysia. [2017-07-16]. ^ Yeen, Oh Ing. Closer ties between Putrajaya and Sejong, Korea - Community | The Star Online. [2017-02-13].